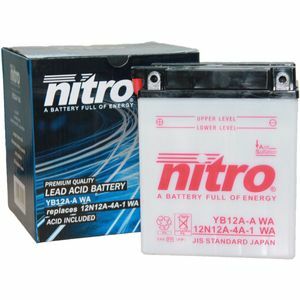 Make no mistake this is a quality battery at the best price around. Thank you for your Good service & the price is good & thanks for your fast service . Good product,prompt delivery.Exactly as described. fitted to my CB400A. Performing perfectly. Excellent service - Battery 100% - Fast delivery. Thank you. Reçu rapidement (3jours) bien emballé. Correspond tout à fait à mes attentes. Very good service and the battery l was very pleased with. Excellent would have liked a bit more fluid for topping up cells prior to charging! Just enough supplied! Otherwise no bad marks off me. Prompt delivery,product fits the bikes as it should,very good price.